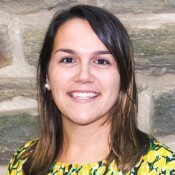 Michelle joined The College of Global Studies in 2017 as Assistant Director of Student Services. She earned her B.A. from Temple University in Psychology and Spanish, and recently completed her Master of Liberal Arts degree from Temple University in 2017. She has always been passionate about studying abroad. While in high school she studied abroad in Maracaibo, Venezuela. As an undergrad, Michelle participated on a program which gave her the opportunity to study abroad in Merida, Mexico. During her senior year, she decided she wanted to go abroad again before graduating and decided to study abroad in Buenos Aires, Argentina, taking all of her courses in Spanish at a local university.